South Beach provides a picturesque blend of tranquility and entertainment. After a long day in the sun, you can relax on your private balcony, invigorate your muscles in your Jacuzzi tub or take a nap in your king size bed. At South Beach, your suite is fully air-conditioned for your comfort with cable TV, VCR and fully equipped kitchen. 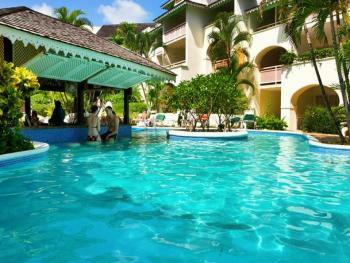 Other on site facilities include open air pool, pool bar and activities center with a range of excellent excursions. The south coast is ever buzzing and boasts a wide variety of restaurants and bars; top local groups make the nightclubs popular with both visitors and locals alike. There is an abundance of shops selling local crafts and gifts, boutiques and a supermarket directly next door to the resort. And, being less than 40 yards from one of the most beautiful beaches on the island...Who could wish for a better location?? Hotel features daily maid service, security guard, currency exchange, internet access in lobby, free limited parking and complimentary use of washers and dryers conveniently located on each floor. Complimentary cocktail on arrival, plus a weekly Managers Rum Punch party serving complimentary drinks and canapés. There is a freshwater swimming pool with a pool bar. The pool contains a 18.2-meter (60-foot) lap-swimming section in the middle, with a plunge section at one end and a shallow children's section at the other end. At Rockley Beach Park across the street from the hotel, vendors rent kayaks, small sailboats, snorkeling gear, boogie boards, personal watercraft and windsurfers. All golfers receive preferential Tee Times and Discounts at the Barbados Golf Club, which offers a championship 18 hole course. Personalized service and customized activities scheduling available. Social activities such as Complimentary cocktail on arrival, plus a weekly Managers Rum Punch party serving complimentary drinks and canapés are sure to get your vacation off to a great start. ·	Fully equipped kitchen with hob, refrigerator, microwave, and a full dinnerware, glassware and silverware service. ·	Balcony with Pool/Ocean View. ·	Jacuzzi bathtub with shower. ·	Living and dining area. ·	Iron & ironing board. ·	Amenities pack including bathroom accessories, tea/coffee, washing up liquid. ·	Wireless internet access for those traveling with laptops. ·	Video cassette player and cable television. Twenty five elegantly restored and refurbished air-conditioned guest rooms, each with a private bathroom, kingsize or queensize bed and personal safe. Mosaic Restaurant offering A La Carte Breakfast, lunch and dinner. Enjoy beachfront dining at Splash Restaurant & Bar located on Rockley Beach, open for Lunch and Dinner. This restaurant offers a casually elegant dining experience for lunch and dinner.